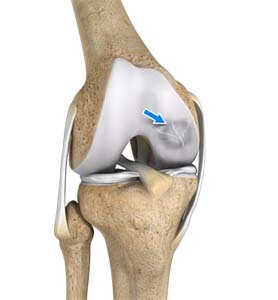 The femoral condyles of the knee are most commonly affected in Osteochondritis Dissecans. The two femoral condyles make up the rounded end of the femur (thighbone). Each knee has two femoral condyles, the medial femoral condyle on the inside of the knee and the lateral femoral condyle on the outside of the knee. Osteochondritis dissecans occurs within the lateral aspect of the medial femoral condyle. The condition can also occur in other joints, including your elbows, ankles, shoulders and hips. The exact cause for osteochondritis dissecans remains unknown and certain factors such as trauma, fractures, sprains, or injury to the joint are considered to increase the risk of developing the condition. Osteochondritis dissecans may be caused by restricted blood supply to the end of the affected bone that usually occurs in conjunction with repetitive trauma. Following the injury or trauma, the bones in the area may be deprived of blood flow leading to necrosis and finally, the bone fragment may break off. This may initiate the healing process, however by this time, articular cartilage will be compressed and a subchondral cyst will have developed. These changes, in addition to increased joint pressure cause failure of the joint to heal.